Hyundai has worked really hard to upgrade the Creta to rival the likes of Jeep Compass, Tata Hexa and the two Renault’s- Captur and Duster in the market. Hyundai India heard the feedback of its audience and has given the 2018 Creta facelift some valuable changes visually. Both the exterior and the interior has received contemporary changes and once again, Hyundai India has done what it does the best. Set a trend with the 2018 Creta Facelift. View offers on Hyundai Cars from Hyundai dealers in Chennai at Autozhop. The biggest change to the exterior is up front and the Hyundai Creta facelift wears the family look, with the new cascade grille. The bi-focal projector lamps are now on the top-spec variant; the fog lamp housing too is new and the DRLs surround the fog lamps, giving it a signature look. Those 17-inch diamond cut alloy wheels too look good on the car; but these are available only on the top-spec variants, while the rest get 16-inch alloy wheels. And the dual tone colour, of course, is an added advantage. The Hyundai Creta facelift looks bigger due to that bold new face; but, overall, the silhouette on the side and tail end remains identical to the pre-facelift Creta. The focus, of the upgrade, is to keep the Creta relevant; and so, a bunch of features have been added. Hyundai has upgraded the level of kit, on every variant of the Creta. It has slimmed down the variants on offer too and now there are a total of 5, as against the earlier 7; but there are no changes to the engine line up and of course the car retains its roomy cabin and boot. You can have matching orange accents inside the cabin, should you choose the ‘Tangerine pack’. By default, the cabin uses the same beige and black combination that we are used to seeing with most Hyundai cars, including the outgoing Creta. Giving in to market demand, Hyundai has added a sunroof over the Creta’s front row of seats. To its credit, it adds an airier feel when open, to the otherwise dark cabin of the Creta.Hyundai has updated its infotainment system with an IPS display that has lesser glare, and a new version of the operating system which gives it better stability. The satellite navigation can also read and alert you about speed limits now by way of prominent chimes played via the (unchanged) Arkamy’s audio system. Hyundai now also gives you a fitness tracker with the Creta that works like a proximity key fob – just in case you don’t want to carry around the bulky key during your fitness routines. The driver’s seat now features six-way electrical adjustment. Space for the passengers, their knick-knacks and the cargo, remains unchanged. Fit and finish was never a complaint in the Creta and the updated model continues to be one of the best in class in terms of overall build quality.The sheer number of Hyundai Cretas on the road has made the design look dated within three years of launch. However, the 2018 update breaths fresh air into the design and makes the car look more sophisticated and premium. The 1.6 petrol has decent low-end pull for city use and a meaty mid range. Beyond 5,000rpm though, the power tapers off. The Creta cruises at 100kmph at 2,500rpm, which is quite relaxed for a petrol car of this size. The 1.6 diesel too has similar characteristics and therefore, suffers from a weak top end. But it’s meaty midrange torque needs a mere 2,100rpm to cruise at 100kmph and overtakes even at high speeds don’t necessarily need a downshift.The Creta continues to impress with a supple ride quality, predictive and progressive braking and a steering that is conveniently light for city use. The performance figures, braking distance and fuel economy readings for all the variants remain pretty consistent with the outgoing model and is on par (or better) than segment rivals. The fuel economy claims have mysteriously gone missing on the new brochure though. The base E trim retains its standard safety features, like dual-front airbags and ABS; but now the seat gets height adjust and a front sliding armrest. The big features, however, are the ones that most people have been waiting for. At the top end, there’s a sunroof, cruise control, a touchscreen infotainment system, which comes with Apple Carplay and Android Auto, Navigation, not to forget, wireless phone charging, which is also a segment first. Then there’s a wearable device, on offer, too; something that we’ve already seen on the Nexon. It’s available with the top-spec variant of the Hyundai Creta facelift and we’ve seen these wearable devices becoming a big part of the automotive world. It keeps the owners engaged with their car. It gives you a whole bunch of information and also tells you how much you’ve walked, throughout the day. The smart band will also let you go keyless, for the car’s operation, of course. Hyundai says that there are no less than 13 additional features, on the Creta, and most of them connect customers, to their cars. 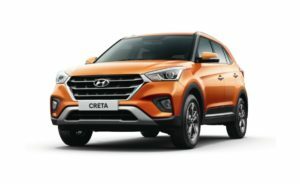 Hyundai Creta On-Road Price in Bangalore ranges from 11,18,681 to 18,45,283 for variants Creta 1.6 E Petrol and Creta 1.6 SX Diesel Dual Tone respectively. Hyundai Creta is available in 13 variants and 8 colours. Below are details of Hyundai Creta variants price in Bangalore. Check for Creta price in Bangalore at Tryaldrive. Previous Post What Happens If My EB-1 Is Denied?